Bacewicz was born in Lódz in central Poland in 1909. Her Lithuanian father gave Grażyna her first piano and violin lessons, and as a child she played chamber music with her siblings, and violin concertos with the local orchestra. She had started composing by the age of twelve. She went on to study composition and violin performance at the Warsaw Conservatory, and philosophy at Warsaw University. After graduating in 1932, she was granted a scholarship by the Polish composer and statesman Ignacy Paderewski to continue her studies in Paris with Nadia Boulanger (composition) and André Touret and Carl Flesch (violin). In 1935, as a virtuoso violinist, she won the prestigious Wieniawski competition in Warsaw. 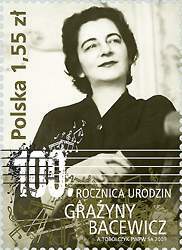 After completing her studies, Grażyna married a doctor, and became principal violin of the Polish Radio Orchestra, which played many of her works. During the war she lived mainly in Warsaw, and continued composing. After the war, she became a professor at the State Conservatoire in her home town of Lódz, and gradually shifted her attention towards composition, for which she had started winning awards and commissions. It was during this period (1948) that she wrote the Concerto for String Orchestra. In 1954 her performing career was cut short by a serious car accident, and she turned full time to composition until her death of a heart attack, aged 60, in 1969. She was a prolific composer throughout her life. Many of her works feature the violin – including seven violin concertos and a great deal of chamber music. She also wrote for piano (she was a formidable pianist and gave performances of her own works), as well as songs, choral music, ballets, four symphonies, a ‘radio opera’, and film scores. She was also an accomplished writer of short stories and novels. Bacewicz had a vibrant yet modest personality, and was much loved by her fellow Poles during her lifetime. In the last few years, her music has been championed by musicians from Poland and beyond, and is becoming more frequently recorded and programmed in concert, giving her the international profile that she deserves as one of the most prominent Polish composers.